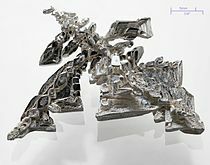 Roentgenium was made in 1994 by bombarding nickel-64 atoms into bismuth-209 to make roentgenium-272. 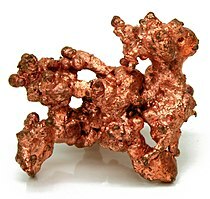 Copper, although toxic in excessive amounts, is essential for life. Copper is shown to have antimicrobial properties which make it useful for hospital doorknobs to keep diseases from being spread. Eating food in copper containers is known to increase the risk of copper toxicity. ^ Fluck, E. (1988). "New Notations in the Periodic Table" (PDF). Pure Appl. Chem. IUPAC. 60 (3): 431–436. doi:10.1351/pac198860030431. Retrieved 24 March 2012. ^ Greenwood, Norman N.; Earnshaw, Alan (1997). Chemistry of the Elements (2nd ed.). Butterworth-Heinemann. p. 1173. ISBN 978-0-08-037941-8. ^ Wright, I. H.; Vesey, C. J. (1986). "Acute poisoning with gold cyanide". Anaesthesia. 41 (79): 936–939. doi:10.1111/j.1365-2044.1986.tb12920.x. PMID 3022615. ^ Wu, Ming-Ling; Tsai, Wei-Jen; Ger, Jiin; Deng, Jou-Fang; Tsay, Shyh-Haw; Yang, Mo-Hsiung. (2001). "Cholestatic Hepatitis Caused by Acute Gold Potassium Cyanide Poisoning". Clinical Toxicology. 39 (7): 739–743. doi:10.1081/CLT-100108516. PMID 11778673.